[/B]If you follow the news, you know that there have been widespread reports of large-scale security attacks on organizations including the U.S. government, Facebook, Microsoft, Apple, Twitter, NBC, the New York Times and the Wall Street Journal. And that’s just in the last month. Add BabyPips.com to that list. We’re currently finishing up an investigation into a recent security incident where an attacker gained unauthorized access to one of our servers. Last week we experienced a few hours of downtime due to a database issue. During our process of system checks, we became aware of a piece of software code that shouldn’t have been there. After further analysis, it became apparent that this code, though inactive, was malicious in nature and most likely intended to look for social security numbers and credit card numbers (which we DO NOT ask for). Upon finding this code, we immediately took measures to remove it and patch the vulnerability that allowed access to that server. It was later determined that the attacker also gained access to member information, specifically usernames, email addresses, and encrypted/salted versions of passwords on that same server. As a precautionary measure, all passwords have been reset. You will be prompted to change your password at your next log in to BabyPips.com (you may have already been prompted to do so in the past 24 hours). Your old password will not work. Please take this opportunity to create a strong (unique and complex) password including a combination of numbers, uppercase and lowercase letters, and special symbols. We’re truly disappointed by this event, but we’re doing everything we can to ensure it doesn’t happen again. We’ve already made some internal changes to help improve our own security efforts, and we will continue to make computer and server security our priority. It will be an ongoing effort, but we’re committed to doing the best we can to keep your personal information safe. If you have any questions or comments about this, please contact us at support@babypips.com. If there’s anything positive to this, it’s that hackers think well enough of you guys to spend their time doing what they did. That’s definitely a positive spin to it. Thanks, MG.
Also do you think the computers of users accessing this site could have become infected with some kind of a keylogger program as a result of this malicious code you found? Our data logs show that the malicious code was mainly a simple remote interface into our server, a backdoor if you will, with some search features. As far as our logs show, the interface was never used. We can only assume that the attackers had future motives in mind, most likely spamming of the forums or spreading malware. Those seem like the highest value actions, given our type of website and lack of financial information. We also don’t have any indication the code was used at all, let alone it having the capability to spread any type of infected file. Saying all that, it’s always a good idea to run up-to-date antivirus and firewall software on your computers and mobile devices. how long since bp team realized got hacked?? If more than half day, i’m affraid they already download all of ur database. Hackers are the best [B][B]information’s collector[/B][/B]. They like ‘hunter’. Treat their ‘prey’ patiently then act ‘blitz’ when they feel all of preparation complete. But i suggest for more secure, all of people here should change all of valuable password with new one. 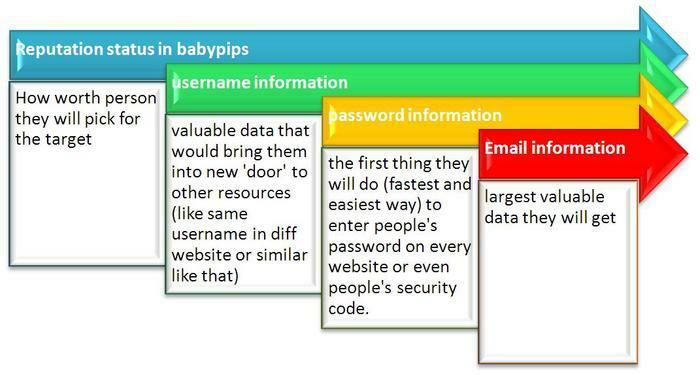 Such as another website than babypips we ever counter or even our security bank password, [B]without any exception[/B].